I'm trying to clamp down SSH access to a OS X 10.5 machine. Its a PowerMac used for testing software under the PowerPC. SSH servers have a "Deny" configuration option that allows us to explicitly deny access based on a user. For a defense-in-depth measure, I want to specifically deny Guest access. Following How can I list all user accounts in the terminal?, the dscacheutil command does not list the account. 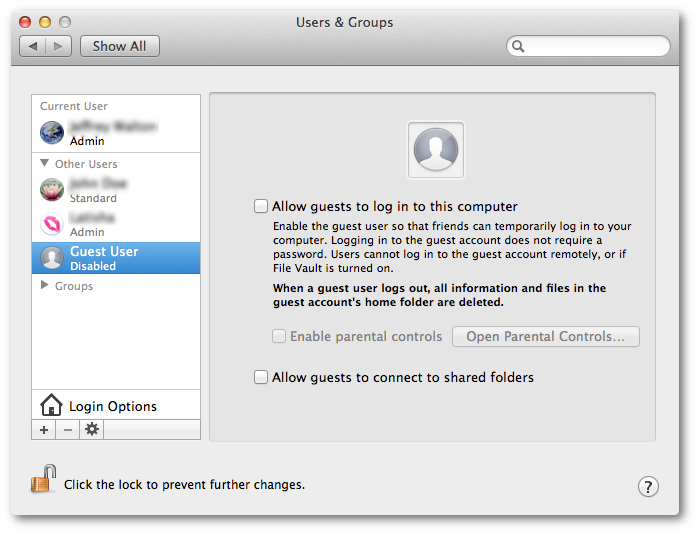 According to the info on the Guest user in the Users & Groups panel, it states that Users cannot log into the Guest user remotely. Having no password on the OS level effectively means that ssh is disabled for that user. The protocol insists on a non-zero password and thus the hashes of whatever password is supplied fails to match the absence of a hash. Not the answer you're looking for? Browse other questions tagged ssh leopard guest-account . Is there a default SSH password on Mac OS X?